The Ocean Park is a theme park spread over two parts, connected to each other by a cable car. A spectacular aquarium, reputed to be one of the largest in the world, is complemented by a funfair containing multiple roller coasters, a space wheel, a swinging ship and much more. 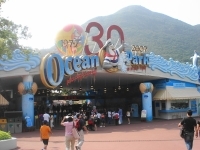 Ocean Park is Hong Kong's most popular theme park, and is regularly ranked as one of the best in the world. Indeed, when Hong Kong Disneyland opened, Ocean Park renovated extensively and has managed to maintain its top spot. The variety of rides is impressive, ranging from big thrill rides to mild fun, and lots for children and adults alike. The rides are interspersed with other attractions, like the animal enclosures - the pandas are a highlight for many visitors, as is the Dolphin Show. Areas in the park include Marine World, Polar Adventure, Adventure Land, Thrill Mountain, and the Rainforest. The cable car rides which transport you from one side of the park to the other are really splendid in their own right. There are many restaurants and stalls in the park. Note that although crowds and queues are usually manageable at the park it is much better to visit on a weekday if possible, because on weekends and public holidays there will be long queues for rides and attractions. Transport: Take City Bus route 629 from either Amiralty MTR Station or Central Pier No.7. Opening times: Daily 10am to 6.30pm.